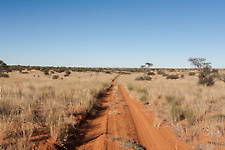 The word Kalahari is derived from the Kgalagadi word for 'Place of Thirst' or 'The land that dried up'. 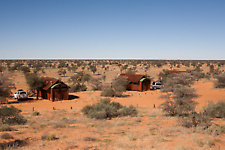 In the Kalahari Transfrontier Park, a spectacular desert landscape with red dunes and scrublands with great wildlife, water is always a scarce resource. 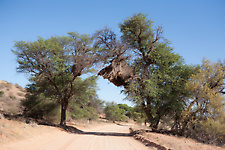 The South African area of the park is mainly located in the southern Kalahari Desert and bordered by the Auob River in the west and the Nossob River in the east. 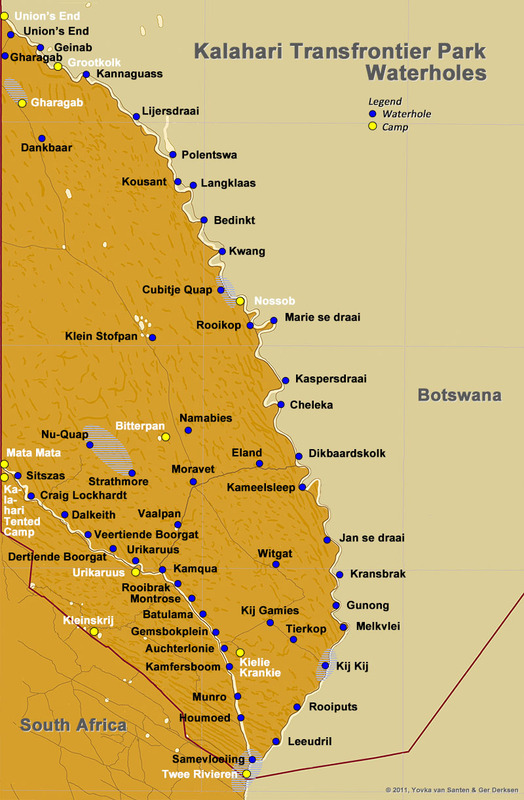 The Nossob river is a 740 kilometer long river flowing from Namibia and Botswana into South Africa. Its origin is in two rivers, the Swart-Nossob and Wit-Nossob, in the Otjihavera mountain range, east of Windhoek in Namibia. The Swart-Nossob (Black Nossob) and Wit-Nossob (White Nossob) confluence south of Gobabis in east-Namibia. The Nossob then goes south and enters South Africa at Union's End. From there it forms the border between South Africa and Botswana for some 200 kilometers. Just north of Twee Rivieren the Auob river merges into the Nossob, flowing south. 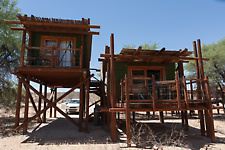 Some 60 kilometers south, near the village of Molopo, the Nossob confluences with the Molopo river. The Molopo river used to end in the Orange river, near Augrabies falls, but today is blocked by the sand dunes near Noenieput (south east of Koo Pan). 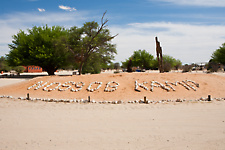 The second ephemeral river in the Kalahari Park is the Auob river. 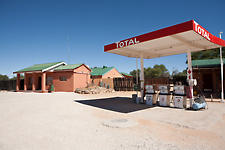 The Auob origins in Namibia, northeast of the city of Mariental. It enters South Africa at Mata Mata and confluences after some 120 kilometers with the Nossob rivier at Samevloeiing, just north of Twee Rivieren. The word Auob is derived from "Au !ab", meaning "Bitter River". That also relates to the quality of the water in the river: it's of lesser quality than the water in the Nossob. During World War I, the Union of South Africa was concerned about a possible German invasion out of Namibia (Namibia was a German colony then). In order to prevent this, troops were based at the border and in order to provide the soldiers with water, a series of waterholes were drilled along the Auob river. After WWI, a Scotsman, Rodger 'Malkop' Jackson divided the region into farms of about 10-12 km2 in size. The farmers were granted to live rent-free as long as they maintained the boreholes. It explains the scottish-sounding names (Munro, Dalkeith, Craig Lockhardt) of some waterholes. 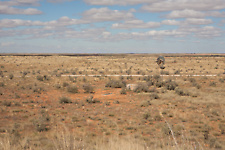 However, conditions along both Auob and Nossob river were quite harsh and, next to the Tsamma melon, hunting was an important survival technique with dramatic impact on the game in the region. Only in the upper part of the Nossob river, where the Khoe people lived, the natural balance was maintained. 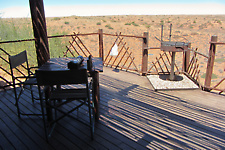 In 1931 the Kalahari Gemsbok NP was proclaimed and boreholes were abandoned. 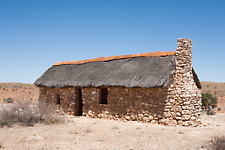 The first warden, Johannes le Riche, lived near Gemsbokplein in a small house abandoned by a borehole guard. Le Riche's brother and successor brought many old boreholes back to live in order to keep wildlife within the park boundaries and safe for poaching. During the WWII, the shortage of bullets for poachers had a great impact on the amount of animals in the park. After WWII the western side of the park became fenced. The eastern side remained open to support east-west migration of animals. 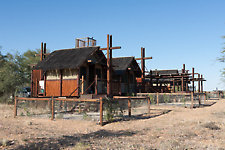 These pages offer an impression of the current Kgalagadi landscape, wildlife and landmarks. 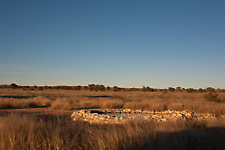 Along both the Auob and Nossob river a series of waterholes is maintained to attract wildlife to the region. 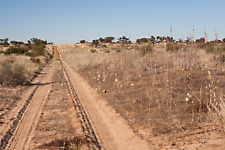 Furthermore, a number of waterholes are maintained in the dunes between both rivers. 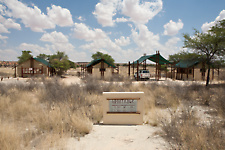 The South-african part of the Kgalagadi Transfrontier Park has three main camps. 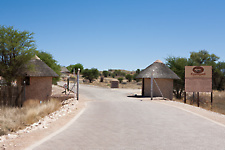 At the southern tip of the Park, Twee Rivieren camp is the entrance point from South Africa and contains the park headquarters. 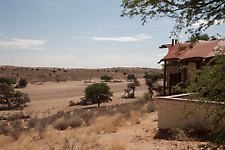 From Twee Rivieren, some 120 km upstream of the Auob riverbed, directly at the Namibian border, lies Mata Mata rest camp; and about 160 km upstream of the Nossob river is Nossob rest camp. 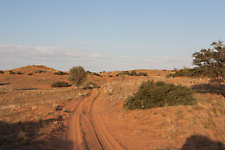 Throughout the park there are also a few Wilderness Camps: small unfenced camps catering for the nature lover: Urikaruus and Kalahari Tent Camp are at the Auob river; Grootkolk is situated in the northern area of the park along the Nossob river and Kielie Krankie, Bitterpan and Gharagab Camp are located in the dunes between both rivers. Not a camp, but definitely worth a visit is Auchterlonie Museum: a small exhibit showing a traditional farmhouse of the early 20th century settlers. It is beautifully located above Auchterlonie waterhole at the Auob river.